The 33 MHz Macintosh Quadra 630 was released in 1994 as a replacement to the 25 MHz Quadra 610. 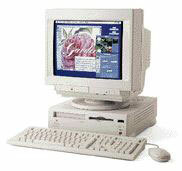 The Quadra 630 was also the same as the Performa 63X series and 64X series, as well as the LC 630. The Performa and LC versions used 68LC040 CPUs instead of the full 68040 found in the Quadra version. (The LC version lacks the floating point unit.) The Quadra 630 came in a totally redesigned and modernized case style, featuring a CD-ROM drive, and a floppy drive. There was also an optional TV-tuner card that let you use a remote control and watch TV on your Mac's monitor. The 630 had front mounted volume controls. The built in video supported 640 x 480 at thousands of colours, and 800 x 600 at 256 colours. If you look at the back of a 630, you will notice that the ports and expansion slots are all together on one panel. If you unscrew that panel, you will see a little handle. If you pull on that handle, you can remove the logic board (or motherboard, whatever you want to call it). You will also notice, in the back, that the video port is separate from the logic board. This allowed Apple to install a variety of logic boards in a single case. These little "features" make it very tempting to upgrade your 630. By now you are probably wondering why you shouldn't upgrade your 630. I mean, you can just swap a logic board in and you're good to go. Your Quadra 630 uses a 33 MHz 68040 or 68LC040 processor, which delivers pretty good performance for a 68K Mac. Consider swapping that with a Performa 6200 series logic board. The board might cost you $150, and you will have the advantage of running PowerPC only programs, such as Internet Explorer 5, Hotline, Office 98, and AppleWorks 6. But what most people don't realize is that the 6200 was actually a tad slower than the 630! That is comparing a 75 MHz PowerPC 603 to a 33 MHz 68040! The Performa 6200 series' logic board was an LC 475/LC 630 style logic board modified to work with a PowerPC chip. That meant the PowerPC 603 at 75 MHz was running at the same bus speed as the LC 630 (which reduces the performance). There is nothing wrong with that PowerPC 603/75 MHz chip, just the way Apple used it. The 6200 and 6300 series (except the 6360, which had an entirely different logic board) is very slow with graphics and almost intolerable (for a Power Mac) on the internet. It is wiser to invest your $150 in a better machine. Of course, if someone offers you a road apple 6200 logic board for free or close to it, take it. It might give your old Mac another year or so of life. Now, if you decided that you wanted really good performance, you could opt for a Performa 6360 board. That just slides in like the 6200 board, right? Wrong. This involves doing a power supply swap too. The 6360 is based on the same architecture as the 6400 and 6500 series, which means it is a PCI PowerMac. The PCI slots require a bit more power than the PDS slot found in the Quadra 630 and Performa 6200 series, so the 630 power supply will not work properly. Buying the 6360 board will cost about $250, plus $20-$50 for the 6360 power supply. That is, if you can find them at all. You must buy new memory, because the 6360 uses a special kind of DIMM RAM chip, not the 72-pin SIMM that the Quadra 630 uses. RAM will cost another $150. Add that up and you should get a figure somewhere near $400-$450. That is just to upgrade your Quadra to a Power Macintosh 6360. I am not including a hard drive upgrade, which would be another $100-200. Since used Performa 6400s and Power Macintosh 6500s can be had for under $300 now, it makes no sense to spend $400-$600 to upgrade a machine to standards that even the slowest 6400 would match or beat. Through this whole article, I have been telling you why not to upgrade your 630. What about what you can do with the 630 as is? You can of course connect to the internet, download email, do word processing, play some games, and even watch TV (if you have the Apple TV Tuner Card upgrade installed). The only upgrades you may want to consider are more memory (36 MB max) and replacing the 68LC040 with a full 68040 (see Quadlist for experts on that). If you choose to replace the hard drive, be sure to buy one that is PIO Mode 3 or lower; many users have found out the hard way that IDE drives with higher PIO modes will not work. If you have a Quadra 630 and would like a faster machine, look for a NuBus PowerMac, the 6100, 7100, or 8100 series. If you want PCI, try out a Performa 6400. You will find you can get one of those for the same or less of what it will cost you to upgrade your Quadra to give respectable PowerPC performance.